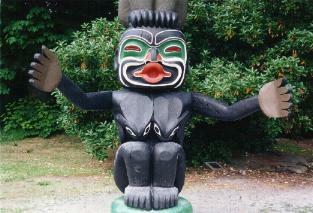 Stanley Park, Vancouver's first, is an evergreen oasis of 1,000 acres close to the heart of Vancouver's downtown core. There are many transportation and tour companies that have a variety of tours to show its splendor. Its natural west coast atmosphere offering a back drop of majestic cedar, hemlock and fir trees embraces visitors and transports them to an environment rich in tranquility. The park abounds in wildlife and its features appeal to the naturalist, the plant lover or one who would do nothing more than relax in beautiful surroundings. The Nature House, located on Lost Lagoon's south side, offers educational materials as well as seasonal walking tours. Lost Lagoon is the haven for many varieties of birds including swans, ducks and Canada geese. The rushes and small islands in the lake make a natural nesting place for the various species that live here. Yearly visits to this, North America's third largest urban core park, are estimated at eight million people. Originally home to Burrard, Musqueam and Squamish First Nations people, Stanley Park as you see it today was not one designer's grand scheme but more an evolution of a pioneer city's hopes and dreams; a place for its citizens to recreate themselves through active sport or passive repose.